November 12, 2018 By Lori 4 Comments THIS POST MAY CONTAIN AFFILIATE LINKS. PLEASE READ MY DISCLOSURE HERE. Don’t let the title scare you off…you CAN make the perfect poached egg. I’ve got the inside scoop right here. 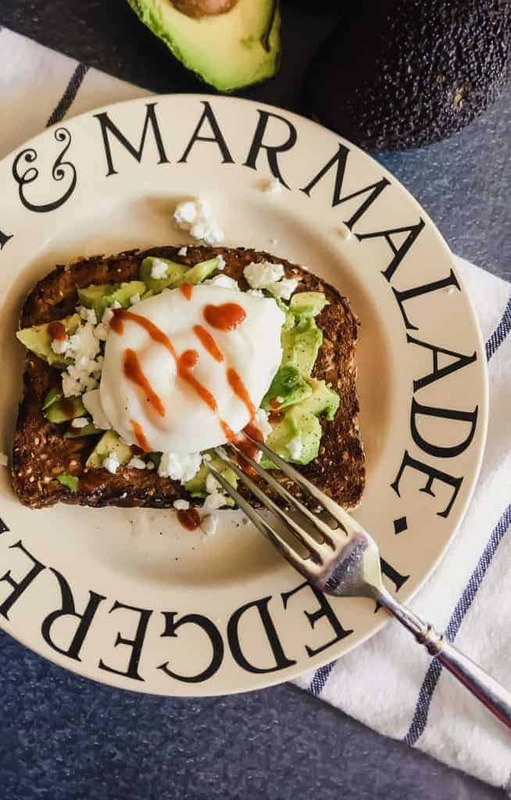 And sriracha and feta take ho-hum avocado toast to the next level. Great morning! I mean…morrnings are GREAT when I have this to look forward to for breakfast. Period. Poached egg perfection is doable, achievable and every kind of -able.I found this technique on one of my favorite sites, Serious Eats, run by Chef Kenji Lopez-Alt, who discovers and shares “how-to’s” for just about every culinary question. And knowing how to make the Perfect Poached Egg (PPE for short) can take you just about anywhere a touch of semi-runny yolk is required. On pizza, in ramen, on top of grilled cheese, avocado halves…I could go on an on. And avocado toast? It’s not kitchen magic that’s for sure. 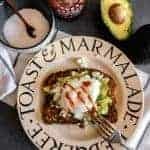 If someone told this California-born girl back in the “olden days” that someday people would be making big money from spreading avocado on toast and charging $12 for it, I’d have answered with “and sure, I’ll be talking into a watch like Inspector Gadget too.” Regardless, I’m in love with avocado toast but can’t bring myself to order it out because it’s just too darn easy to make it at home. Bring about 2-3 inches of water to approximately a 170 degree simmer. You can use a thermometer or just eyeball it to look like the image. There should be tiny, little bubbles coming to the surface. I suggest using a thermometer the first time you try this and after that use your peepers. Trust your gut (ok – I admit to making a little game out of this combining the eyeballing and the thermometer but I digress). While the water comes to temp, position your strainer over the top of your small bowl. You can see that my strainer is larger than my bowl. (Someday I will buy the perfect tiny strainer but who wants to be perfect? ) 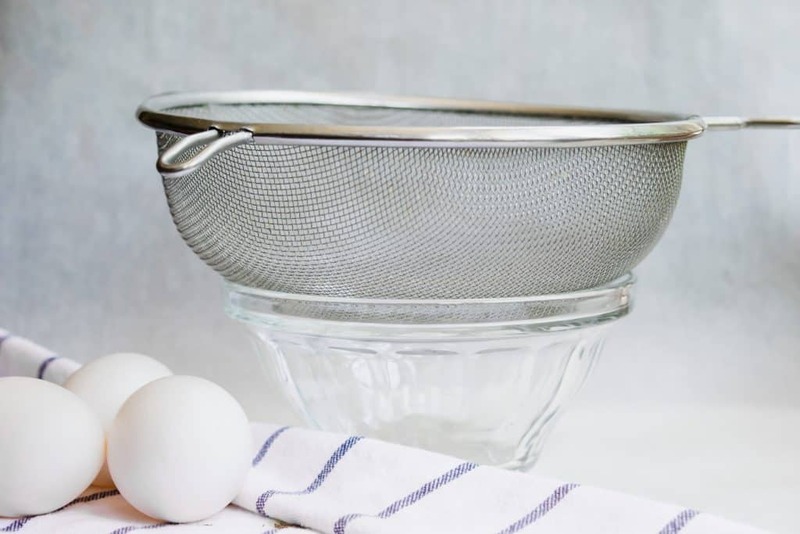 Next, gently crack your egg (never on the side of the bowl – one good tap on the counter does it) into the strainer and swirl it once to remove the excess white. THIS IS THE SECRET. You won’t have all those pesky little tails on your poached egg. Promise. 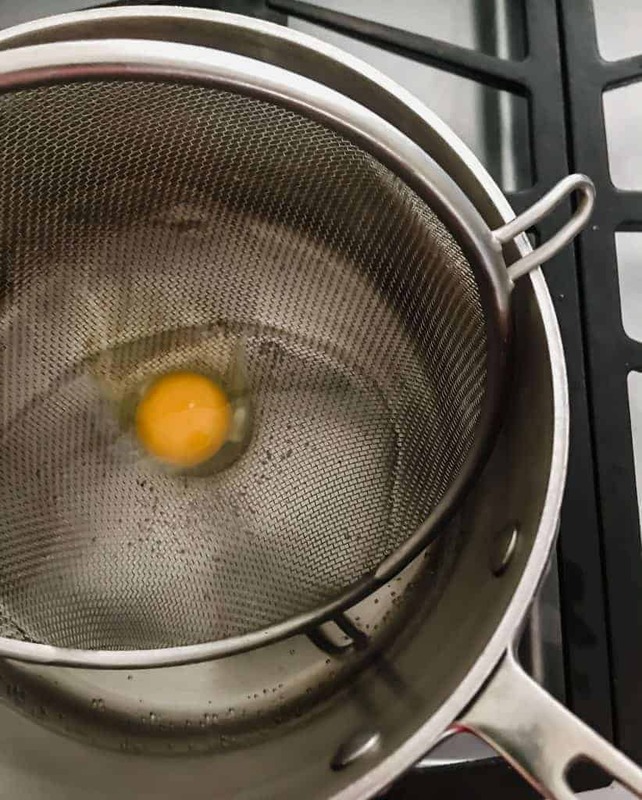 Once your water comes to temp, pick up your strainer and lower it into the water and angle it until the egg slides out happily into the saucepan. Immediately set your timer for 2:30. The egg will hang out on the bottom of the pan and slowly start to form a perfect shape. No swirling, no vinegar – no nothin’. Meanwhile, toast your bread until all toasty and golden or dark depending on your mood. And open up and pit your avocado. 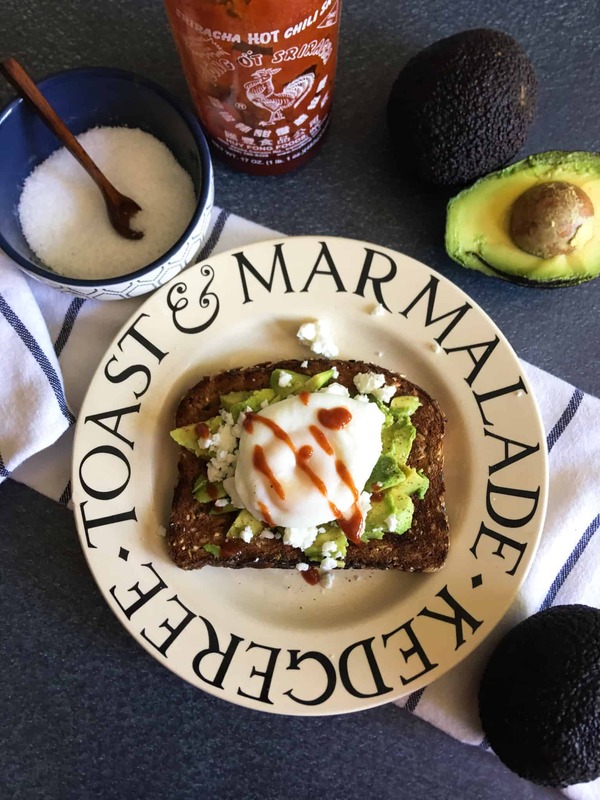 Slice or mashed or cube your avocado on to your toast and top with crumbled feta and a copious amount of pepper. Because pepper, my friends, is essential to successful avocado toast (or guacamole for that matter). 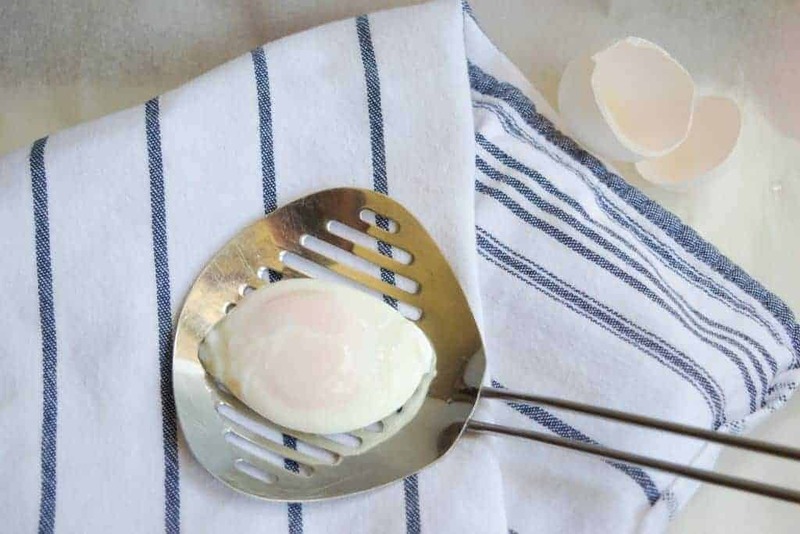 When your timer goes off, take your slotted spoon and lightly scoop the egg from the bottom of your pan and place it for a second on your paper towel/plate to remove any water. 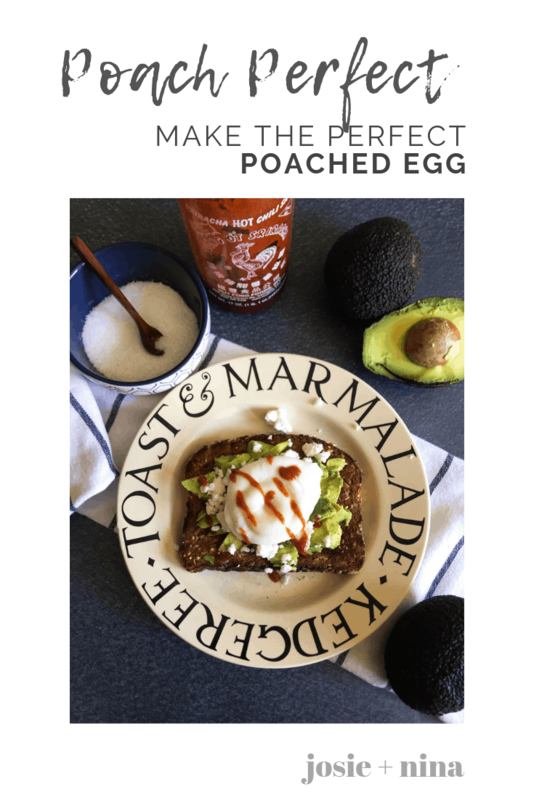 Place your egg on to your avocado toast and grab your favorite sriracha or hot sauce or gochujang and give it a good drizzle. You can make several of these poached eggs at a time. Depends on the size of your pan of course. The most I have done in a 4 qt. pan is 3. You can cook them and refrigerate them and drop them back in simmering water just before serving. I’ll admit – we’ve used a microwave for 15 seconds too. These would make a great dinner, with some prosciutto in which case I’d use four eggs for two people. Or maybe some leftover carnitas layered on top of the avocado and then the egg. 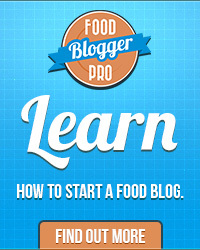 Oh yeah…that recipe is coming soon. Crack the egg into a small strainer set over a bowl small enough so the strainer doesn't hit the bottom. Swirl once and allow the excess egg white drip into the bowl below. Once the water comes to temperature. slowly lower the egg into the water and tilt the strainer to slide the egg into the pan. Immediately set a timer for 2:30. Toast bread until desired doneness. Mash, slice or cube avocado and place over bread. Top with salt, pepper and even some everything bagel seasoning from Trader Joe's. Once the timer goes off, grab your slotted spoon and remove the egg from the pan and place on a paper towel lined plate to remove excess water. Place egg onto toast and drizzle with hot sauce of your choice. What an interesting to poach the egg using the strainer. I can’t wait to try! Thanks Stacey! Let me know how it works out for you. It really is a game changer in our house! I just tried your method for poaching the egg! It was my first poached egg, ever. You made it seem so easy! While mine wasn’t as pretty as yours but I will definitely be doing this again. Delicious! I am sure it was great! I have practiced ALOT and it definitely takes some time management but is so easier without all the swirling and stuff. The next time you do it it’ll be even better! Thanks Erin!